And why does your small business need a mobile friendly website? Responsive website design provides a mobile friendly website for your visitors. This allows your website to be viewed easily on mobile phones and tablets without having a separate mobile website. It allows for easy reading and navigation across all devices – desktops, laptops, tablets, and phones – without the user having to resize or zoom the site. And because only one website is needed, responsive website design gives you an affordable, small business website. According to study findings, 24 percent of total website traffic came from mobile devices in the beginning of 2013 — up 78 percent from the same time in 2012 and 109 percent since 2011. Each year more of your website traffic will be from mobile devices; depending on your business, you may have more traffic from phones than from desktop computers. If you have a mobile friendly website that is easy to access on all devices, including mobile phones and tablets, customers and clients are able to interact with your site from anywhere, not just when they are at home or at work. As more people use mobile as their primary method to access the internet, it becomes more important to present your website content in a manner that all viewers can access. Responsive design allows the content of your website to change with the size of the device, whether desktop, laptop, tablet, or mobile phone, so that the content is accessible on all devices, just like you see in the image in this post. You can see for yourself how the content adjusts to fit the screen size by grabbing the side of your browser window and pulling it in to make the view screen smaller or just view the sites on a mobile phone or tablet. The design of responsive, mobile friendly websites also remains consistent across different size devices. That means that a customer or client will immediately know they are on your site and not another site. Why not use a separate mobile website? You will need to keep the content on both your normal site and your separate mobile site up to date. That’s more work than for one website that works on large screens, but is also mobile friendly for phones and tablets. Do you really have time for two websites? Or would you rather spend your time on your small business? Usually a separate mobile site is a stripped down version of the main site. This means all your content may not be available to all visitors. You work too hard writing your content for your small business website; you want all of it to be accessible to your customers and clients. Separate mobile sites often have a more generic look which may confuse customers who access your site with both mobile and desktop devices. It usually costs more to make a separate mobile site. So think about how your visitors interact with your website. Is your small business website mobile friendly? Is it easy to read and navigate your website on all devices, including mobile phones and tablets? If not, think about getting a mobile friendly, responsive website design. You can have a beautiful, hardworking website for your small business. Tell me about your website project for a personalized solution! Do you need website tips? Sign up to get easy-to-use WordPress tutorials, Genesis theme customizations, and other helpful tips for your small business website. 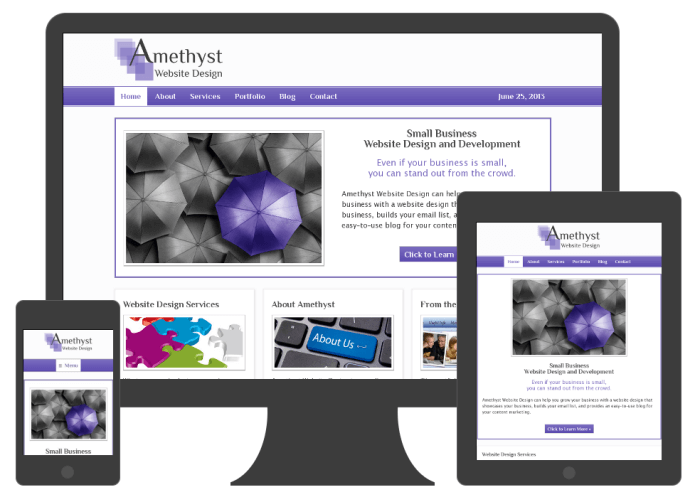 I'm Marcy Díaz, the owner of Amethyst Website Design, a small business located in Phoenix, Arizona (in Ahwatukee Foothills). I help people, like you, grow your business with an affordable WordPress website design. Sign up for my blog and website tips that help you manage your own website. You’re welcome. And I agree that the need for responsive, mobile friendly websites is growing, as more people learn about it.